The mojito is Cuba’s national drink and folklore has it that Ernest Hemingway was a big fan when he stayed in the city. 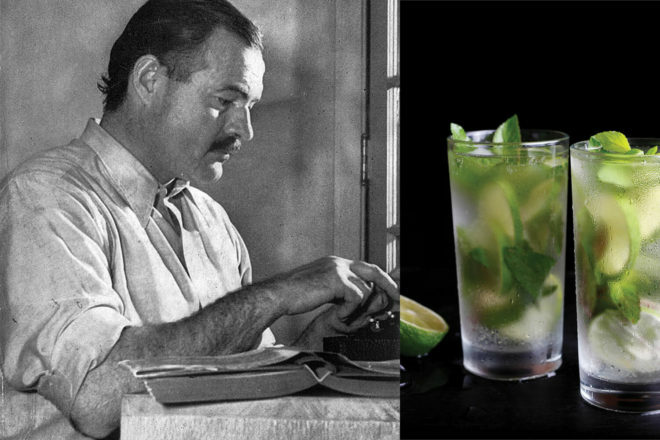 The Mojito is Cuba’s national drink and folklore has it that Ernest Hemingway was a big fan when he stayed in the city, frequenting La Bodeguita del Medio in the Old Town to sip his favourite tipple, which he supposedly took with Champagne rather than soda water. His other drink of choice was a daiquiri at the bar El Floridita, which has a framed message from the writer: ‘My mojito in la Bodeguita, my daiquiri in el Floridita’, although the authenticity of this is now disputed. Mash the lime juice, sugar and eight mint leaves in a highball glass with the end of a wooden spoon. Add the ice and pour over the rum, stir well and top with club soda. Garnish with a sprig of mint.